This was Amanda’s first translation and the first of three she co-wrote with Anthony Holden; it was for Jonathan Miller’s ENO production in 1987. The work was a rushed job as the commissioned writer had dropped out and it was touch and go whether these inexperienced opera translators would finish the job in time. But, with much help from Mark Elder, it was completed in six weeks. This was the start of Amanda’s career in opera – at that time she was on the teaching staff at the Guildhall School of Music and Drama. The translation has been often revived and revised. It was used (and slightly abused) for two subsequent productions at ENO. 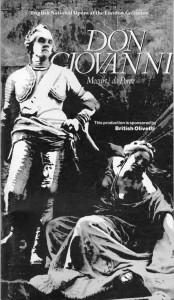 For David McVicar’s Opera North production in 1999, Amanda and McVicar worked together and revised the translation substantially; this is the version that is recorded in the Chandos Opera in English series. what a way to earn my keep! it’s not the life for me. doth shine for my pleasure?